It was bound to happen. I even predicted it a while ago. I just never thought it would actually happen. Skully's has dropped the name "Ladies 80's" and are going with "The Retro Party." 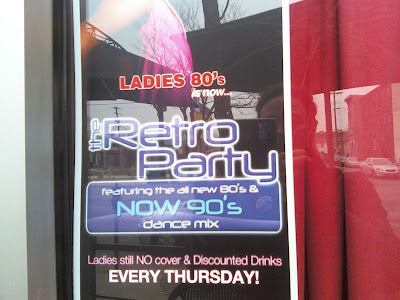 It's not like the dance music from all of the 80s was good. There was a good bit of crap through the early 80s. Yeah, yeah... and the rest of the 80s as well. There's some good stuff tucked into the early 90s. Skully's was starting to play 90s music as well. No one really cared as long as it was fun to dance to. We are going to do some light recon and check it out. We assume it will be exactly the same. I just hope the Doug In Five Years doesn't stop coming. Nor the Terminator Guy. Guy in the Dress. Outland Girl. And who can forget Bump into You Drunk Girl. Hopefully they will all come back. Not creepy old guy thought. I think his position is being taken by someone else.